The Social Marketeers offer a range of services for some of today’s top networks, including Facebook, Twitter, and Instagram. The company has been in business since 2010, and claims to have helped many customers become viral stars. The Social Marketeers offers standard page like packages for Facebook, ranging from 1,000 likes to 10,000 likes. Although they do not offer larger packages like other providers, their packages are perfect if you’re looking to increase your likes over time and want your growth to look more organic. The company provides multiple ways to get in touch with their customer support. You can reach them through email, live chat, on-page contact form, and via their support center. They also have an informative FAQ page, which is sufficient enough to answer any of your general inquiries about their company and services. Overall, we recommend The Social Marketeers for growing your Facebook page gradually, which is a great strategy to achieve organic-looking growth on the platform. Established in 2010, The Social Marketeers is a boutique, high-end social media company. They also offer a full suite of digital marketing services, including online reputation management and website design. The company has a range of Facebook packages, such as likes, followers, Facebook Live viewers, shares, and check ins. Apart from Facebook, they provide services for YouTube, Twitter, Instagram, and other social networks. 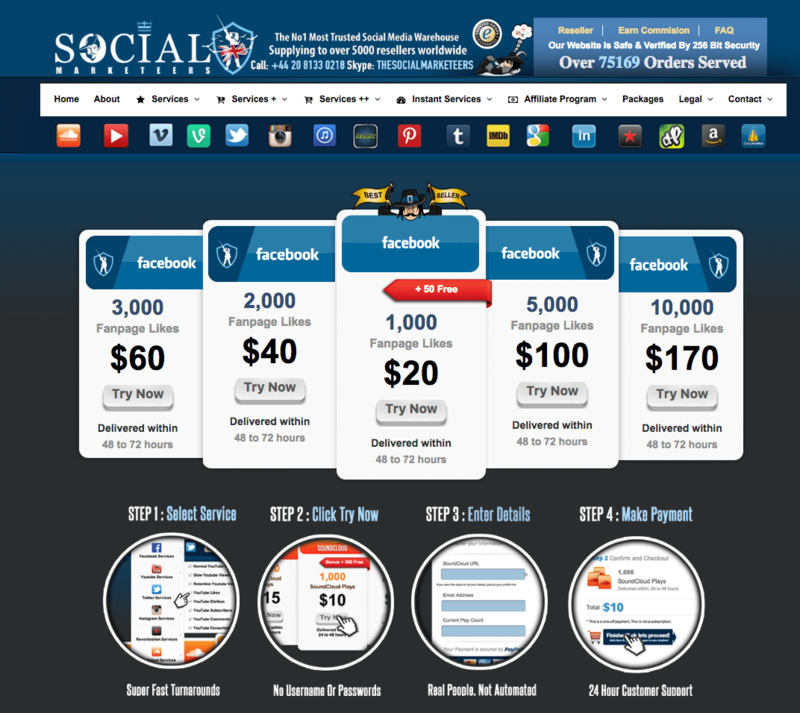 The Social Marketeers offers the cheapest price guarantee on the market. They will happily give you a 5% discount should you find another provider that has cheaper packages than them. According to them, they use 100% real human promotion and offer a full money-back guarantee. To ensure customer satisfaction, The Social Marketeers claims to provide 24-hour customer support. They also have a support center where you can send and track requests. For other types of inquiries, you may use their contact form. 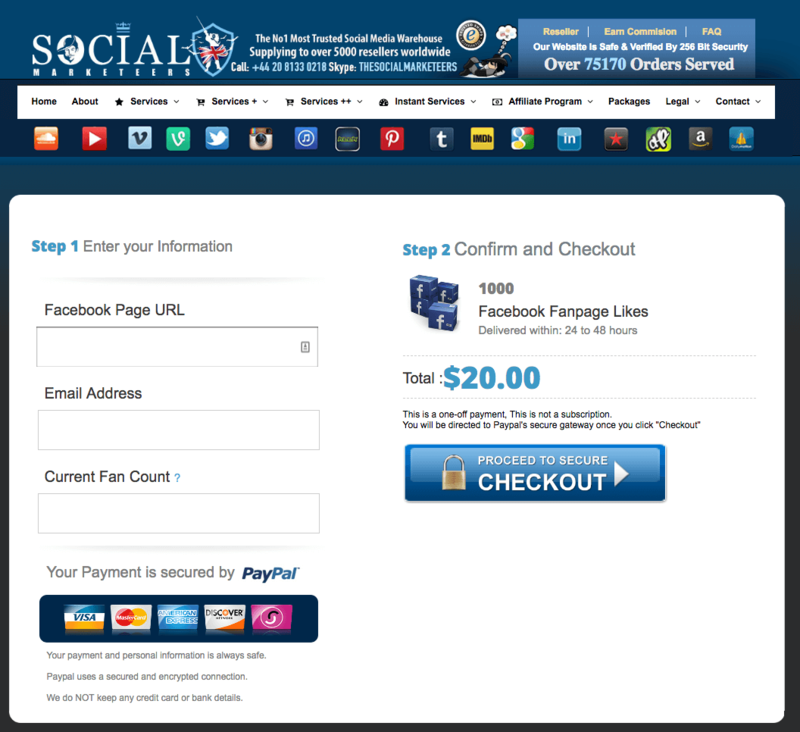 The Social Marketeers offers Facebook page like packages starting at $20, which is within the industry average. Their bestseller comes with 1,000 likes plus 50 free likes. The company’s biggest package costs $170 for 10,000 likes. According to them, they will start delivering your order within 48 to 72 hours. To purchase a package, you’ll need to give your Facebook page URL, email address, and current fan count. Payments are made through PayPal’s secure checkout gateway. By using their website, you accept their TOS and any changes that may occur on the website. Content on the website are provided “as is.” The Social Marketeers does not guarantee its accuracy and reliability. Service purchase and usage of their materials are done at your own risk. Their policy states that they collect personally identifiable information, such as your name and email address. They use this data to deliver your order, respond to your inquiries, and send emails about their services that you may be interested in. The company states that they do not sell, trade, or give your information to third-parties without your consent. The company’s TOS contains a short section dedicated for their refund policy. You will also find a separate page with detailed information about it. The policy states that refunds are given as credits, which can be used to purchase other services. You can request a full refund within five hours of purchase, or if The Social Marketeers fails to start delivering your order in 48 hours. Partial refunds may be given if the company fails to deliver 100% of your order within the specified time frame. The Social Marketeers has a 60-day retention policy. If there is any drop in your likes or followers, simply contact their customer support and they will replace them for you. You can reach their customer support through their on-page contact form and live chat. They claim to provide 24-hour support, but when we tried their live chat during office hours they were offline. The company has a Support Center, where you’ll be able to choose the category that your inquiry falls in. 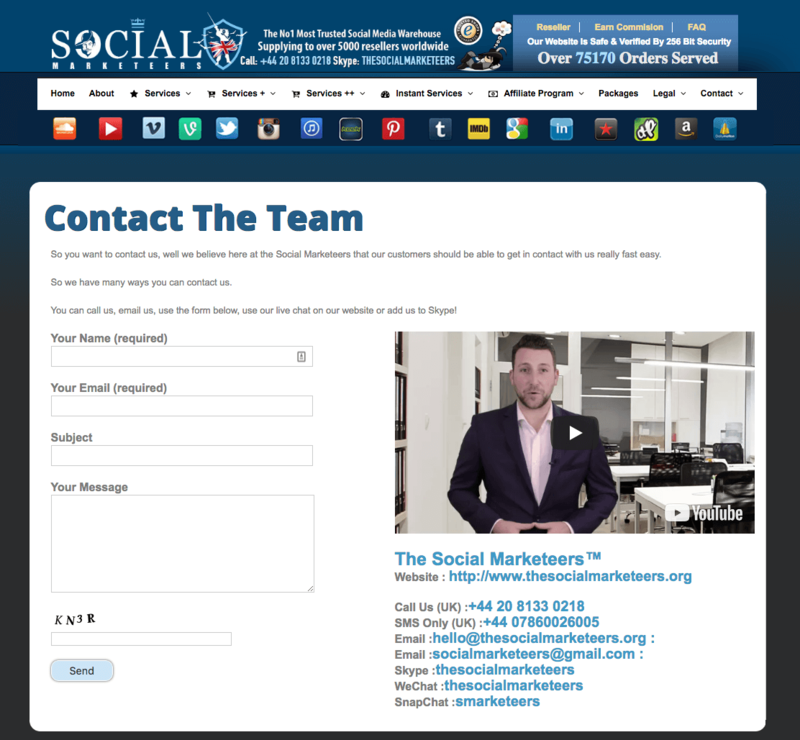 Their email is hello@thesocialmarketeers.org. Their FAQ page allowed us to get the information we needed. The Social Marketeers provides engagement and growth service for different social networks. If you’re looking for a safe and effective way to grow your Facebook page, consider purchasing any of their Facebook like packages. They claim to deliver likes within 24 to 48 hours upon placing your order. Additionally, they provide a full money-back guarantee and 60-day retention policy. These customer protection policies put you at ease should you experience any drops in your likes or followers. These policies also protect you against instances where you don’t receive your order in full, or within the specified duration. Their FAQ page states that all orders are usually completed within 24 hours. If there are problems regarding the delivery of your order, they will contact you through email. According to the FAQ page of The Social Marketeers, their likes and followers are from inactive users. While they will not engage with your social profile besides for the service that you purchased, they could definitely help improve your credibility on the platform. Because the likes you will receive are mostly from inactive users, there is a lower chance that they will drop. If they do, The Social Marketeers has a 60-day retention guarantee. If there is a drop within this period, just get in touch with them and they will redeliver. The Social Marketeers has a full suite of social media promotions services for Facebook, YouTube, Instagram, Twitter, and other networks. Their Facebook likes packages are small, but perfect for those who want to grow their likes gradually, instead of in one go. The company has solid customer protection policies, which is a sign of a trusted Facebook likes provider. 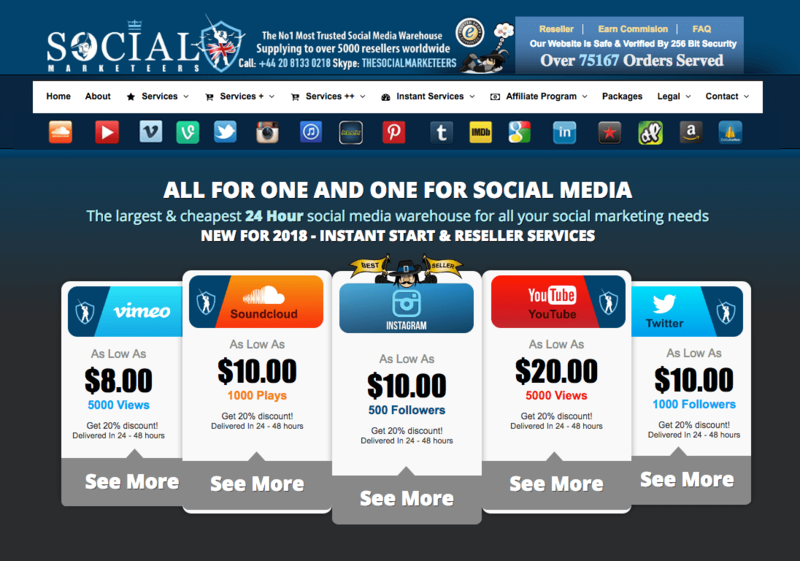 One thing that is notable about The Social Marketeers is their cheapest price guarantee. It’s not often that you see a provider offering this type of guarantee, which only goes to show how confident the company is in their prices and services. With all their guarantees that protect you and your purchases, we recommend The Social Marketeers as a good provider of Facebook likes. Click the button below to visit their site now! I benefited from their Instagram service and the followers I requested for came in in a record 3 days. Couldn't ask for more.